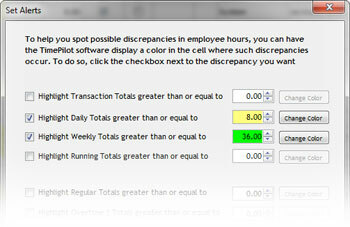 To set an alert, click the checkbox next to your preferred category, then enter the number of hours that should trigger the alert. Remember that TimePilot uses hours and tenths and hundreths of an hour instead of hours and minutes, so, for instance, if you want to enter 8 hours and 30 minutes, you’d enter 8.5 hours. For a handy downloadable chart that converts minutes to decimals, click here.